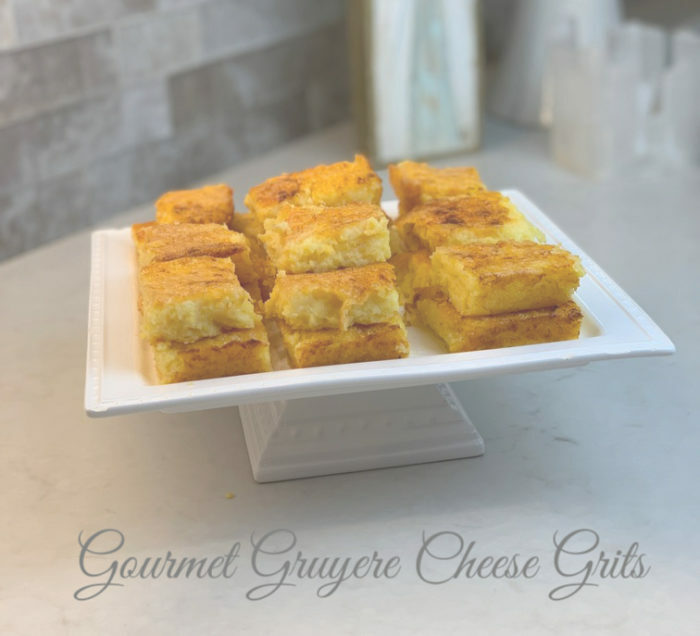 These savory gourmet Gruyere Cheese Grits are a standout side dish that folks will rave over, and they can be made up to 3 days ahead for stress-free entertaining! 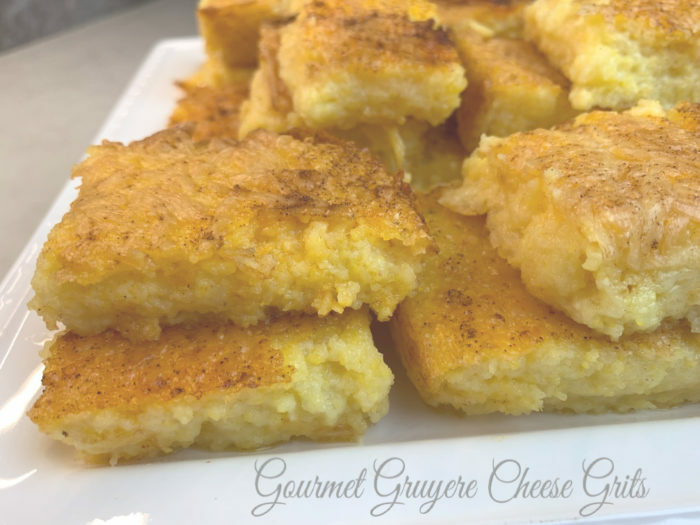 These gourmet Gruyere cheese grits are my “signature side dish.” No matter what occasion~holiday, birthday celebration, cookout or other~everyone asks me to bring these grits. They are insanely yummy, and no one ever tires of them. The first time I ever tasted these grits, it was love at first bite:-) My friend Jill brought these to me for a new mommy meal (I’d jut given birth to Emma, my youngest). The meal was divine~pork tenders, a fabulous salad, and these grits. I asked Jill for the recipe and have been making these ever since. Jill got the recipe from Food For Thought, a Birmingham Junior League cookbook that I bought shortly after sampling these fabulous grits. Since then, it has become one of my favorite cookbooks. It is full of company-worthy recipes that are perfect for special occasions and entertaining. Although any grits will work in this recipe, I recommend a good quality stone ground. My favorite grits are from an Alabama gristmill~McEwen & Sons. I love their yellow and white grits as well as their fabulous cookbook, Glorious Grits, It has over 100 recipes using stone ground grits, cornmeal, and polenta. Make ahead: These grits are FAB for entertaining, as they can be made all the way up to the point of baking (but not baked), covered, and refrigerated for up to 3 days. When time to serve, simply remove from the fridge and bake at 350 F until hot and beginning to crisp at the edges (roughly 30-40 minutes). Serving suggestion: The grits can be served directly from the baking dish, but I like cutting them into squares. They look nicer on a dish if cut, but you do need to allow a bit of extra time if serving them this way. Simply turn the dish over on top of a cutting board, cut the grits, and arrange them on a platter or pedestal. I promise these grits are beyond delicious, so give them a try if you’ve never had them before. When you do try them, please share your thoughts with me in the comments below. I love hearing from readers. As always, thanks so much for stopping by. Be blessed, and stay savvy!!! These grits are outstanding and one of my family's favorite sides! The nutty, sharp Gruyere and the Parmesan cheese make these humble grits a company worthy dish. Bring milk to boil over medium heat, stirring often. Add stick of butter and grits. Cook, stirring constantly, until mixture is the consistency of oatmeal (about 5 minutes). Add salt, pepper, and egg (stir vigorously to prevent egg from curdling). Beat until well combined. Add the additional 1/3 cup butter and Gruyere cheese. Stir until all cheese is melted and incorporated. Sprinkle parmesan on top. Sprinkle paprika if desired. 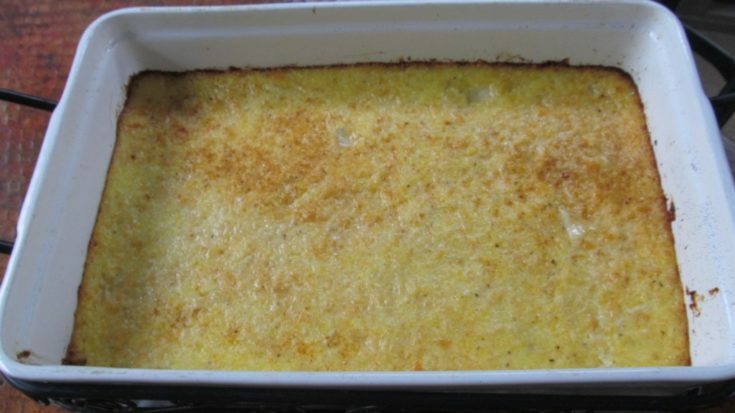 Pour into a quiche dish or 11 x 14 casserole dish. DO AHEAD: At this point, you may refrigerate until baking--all day or overnight. When ready to cook, remove from the fridge and let sit at room temp for at least 30 minutes. Bake at 350 degrees for 45 minutes or until golden and beginning to bubble. Hi Barb! Yes~white stone ground (or yellow) can be used! I actually prefer them. As for the lactose free milk question, I have no idea. Perhaps there is info on google that might answer this for you. Hope you enjoy!!! Can White stone ground grits be used and can lactose free milk be used? I made this after you shared before and LOVE them! Where do you find the grated gruyere? I’ve only found in a block. Never thought about slicing this into squares but love that idea! You just serve them slightly warm that way? Yes! It doubles well. Just make sure to use a large, shallow pan that will allow the grits plenty of room to spread out. I use at least an 11 x 13. Hope this helps! Have you doubled this recipe? These grits are the best. Hands down. I’ve made them literally hundreds of times! Hi Becky! You will LOVE the grits! Let me know what you think when you try them! If you lived in Mobile, you surely did get some wonderful, fresh seafood. Gotta love the Gulf Coast! I love cheese grits. I’ll have to try your recipe. I can tell you are a Southern girl :) We lived in Mobile, AL many years. I truly, truly miss the fresh seafood, especially the fried crab claws.